Science: The Deep Ocean Plays A ‘Leading Role’ In Global Warming. It’s Colder Now Than During The 1700s. Authors of a new paper published in the journal Science (Gebbie and Huybers, 2019) insist “the deep ocean ultimately plays a leading role in the planetary heat budget.” The global deep ocean has much less heat today than it had during both the Medieval Warm Period and the Little Ice Age. 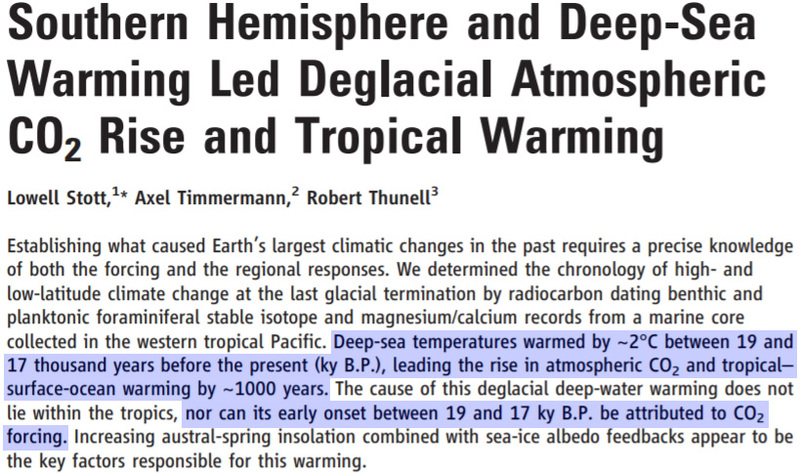 The deep ocean may warm hundreds (to thousands) of years before hemispheric surface temperatures and CO2 concentrations do (Stott et al., 2007). This bottom-up hemispheric-scale heat flux – independent of CO2-forcing – may occur for land area as well. Deep ocean heat leads surface temperature change yet today? 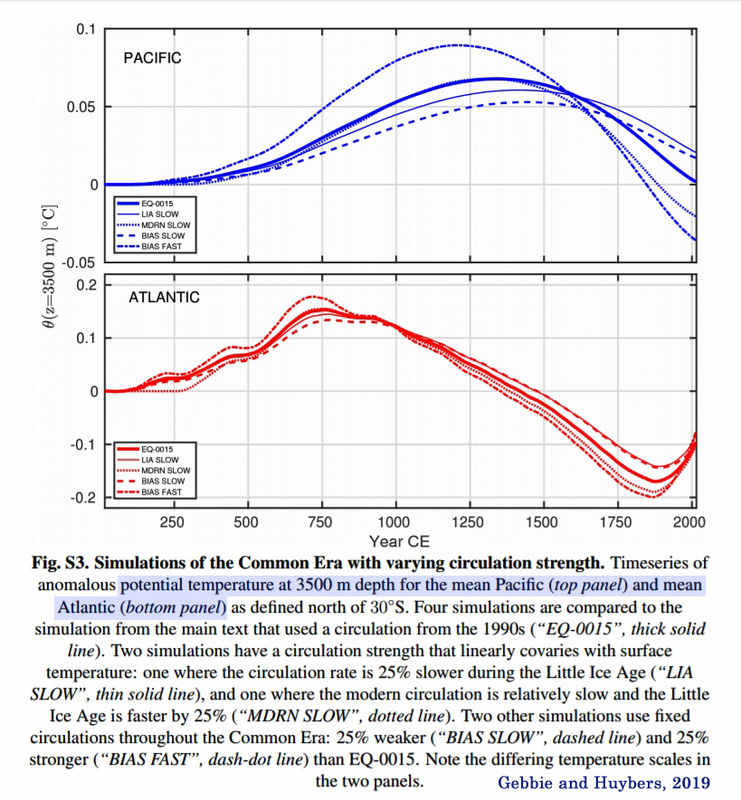 A new paper indicates that the deep ocean in the Pacific has continued cooling in recent decades, extending the long-term cooling trend that commenced after the warmer-than-today Medieval Warm Period ended. Other authors (Wunsch and Heimbach, 2014) have also documented a global-scale deep ocean (below 2,000 meters) cooling trend within the last few decades. Little Ice Age conditions may still dominate in the deep ocean despite the dramatic rise in CO2 concentrations during the last few hundred years — from about 280 ppm during the late 1700s to well over 400 ppm today. 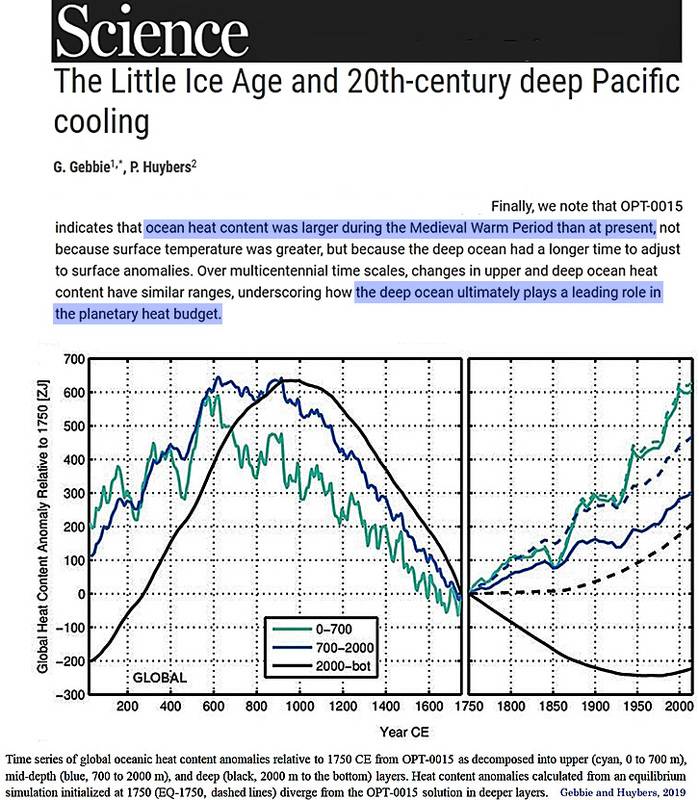 The global ocean below 2000 meters may actually be colder today than during the 18th century. 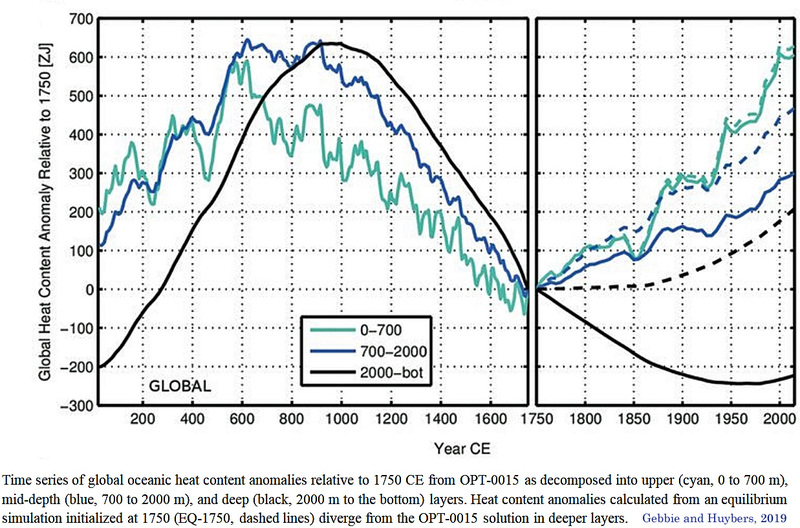 It may be worth a closer look at the graph of global ocean heat content (OHC, 0 m-bottom) during the last 2,000 years from Gebbie and Huybers (2019). It is interesting to note the multiple centennial-scale warming and cooling trends during the last two millennia that exceed the rate and amplitude of the ocean heat changes that have occurred since 1950, or since atmospheric CO2 concentrations began rising dramatically. For example, despite the very modest associated changes in atmospheric CO2 concentrations (< 5 ppm), it appears that both the 1850-1875 and 1925-1945 global warming periods in the 0-700 m layer exceeded the rate and amplitude of the heat content changes since 1950. 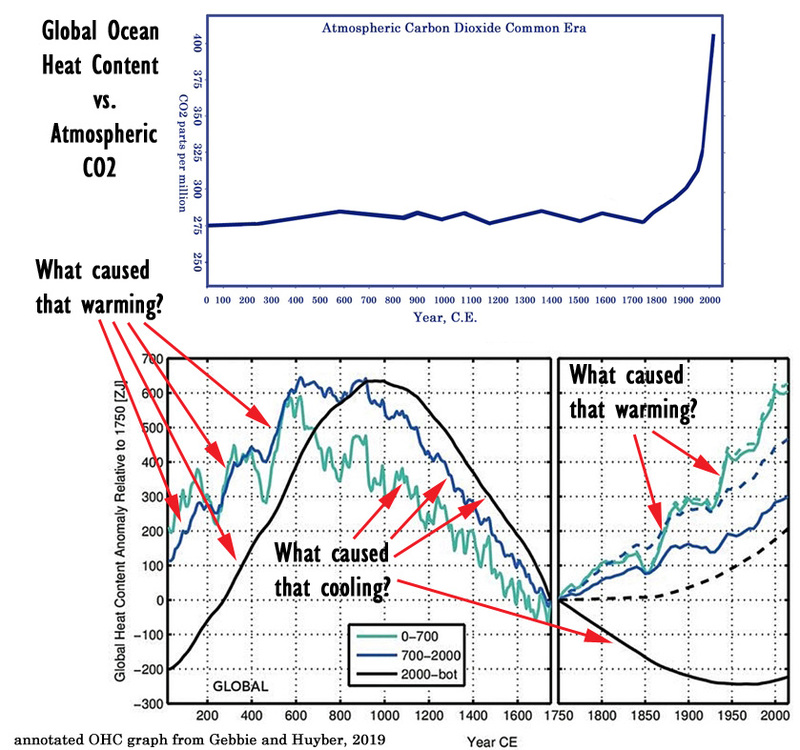 As the global oceans rapidly warmed and cooled in the centuries preceding modern times (i.e., the Medieval Warm Period and Little Ice Age), the corresponding CO2 concentrations were remarkably stable, neither rising with the warming or falling with the cooling. 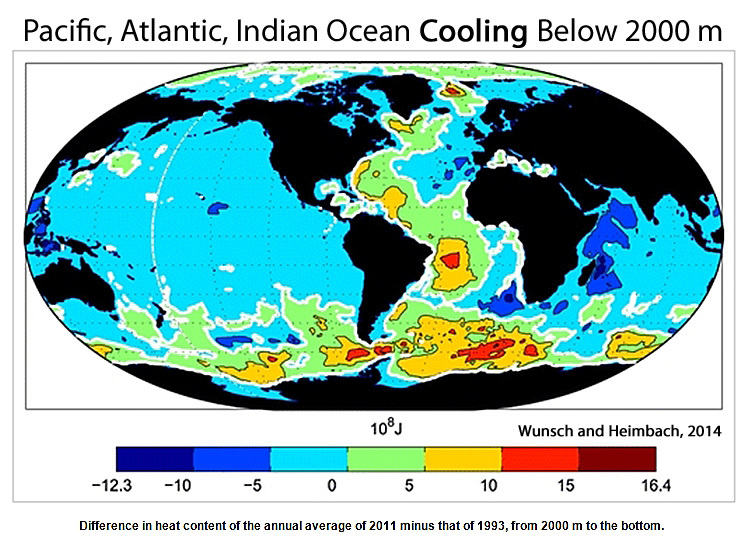 Considering 93% of the Earth’s heat changes are expressed in the global ocean, and that just 1% of global warming is said to be reflected in surface air temperatures (IPCC, 2013), the lack of conspicuous correlation between ocean heat content and CO2 during the last 2,000 years would seem to undermine claims that atmospheric CO2 concentration changes drive zero-to-bottom global ocean warming.